We had a great workshop on essential oils last month. We had a cozy group, and everyone was so interested in the oils that we were discussing. 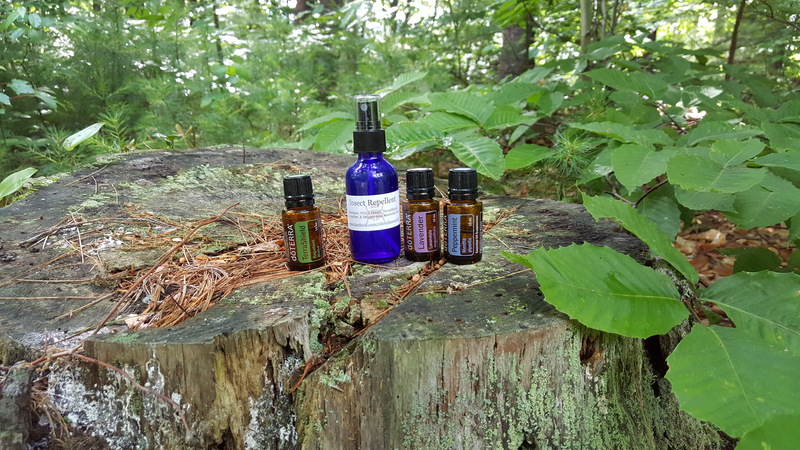 Our focus of the evening was on making 3 different essential oil blends; an insect repellent, an anti-itch spray, and an after sun spray. In a 2-oz glass spray bottle add 15 drops of doTerra Terrashield blend, 5 drops of Lavender, and 5 drops of Peppermint essential oils. Add witch hazel to almost fill the bottle. Put the spray top on and shake to blend. Use insect repellent as needed. Let’s briefly review each ingredient and how it works. doTerra’s TerraShield outdoor blend is made up of Ylang Ylang Flower, Nootka Wood, Cedarwood Wood, Catnip, Lemon Eucalyptus, Litsea Fruit, Arborvitae Wood essential oils and Vanilla Bean Absolute in a base of Fractionated Coconut Oil and Tamanu Seed Oil. All of these oils are known to protect against environmental annoyances such as insect and ticks. Lavender is also known to repel mosquitoes and ticks. It also a restful and calming blend with a nice fragrance. Peppermint like Lavender, is known to repel mosquitoes and ticks. Mice and other insects do not enjoy the smell of peppermint so it helps protect us from them as well. Witch Hazel helps to keep oil from settling and dries quickly on the skin so you do not feel wet after applying the spray. Other essential oils can be used instead of Lavender and Peppermint, such as Lemongrass or Cedarwood. Last week I used this blend while working at a summer camp in the woods. Did it work? For the most part it did. I forgot to reapply after a few hours and had a few bites where I didn’t apply – like next to my watch band and one on my back through my shirt. I had a tick run across my arm, but did not find any elsewhere on me. After a week in the woods, including sleeping out in a tent, I think it worked pretty well at protecting me from mosquito bites and ticks. Can you remove a tick with essential oils?<< >>Where's your number?